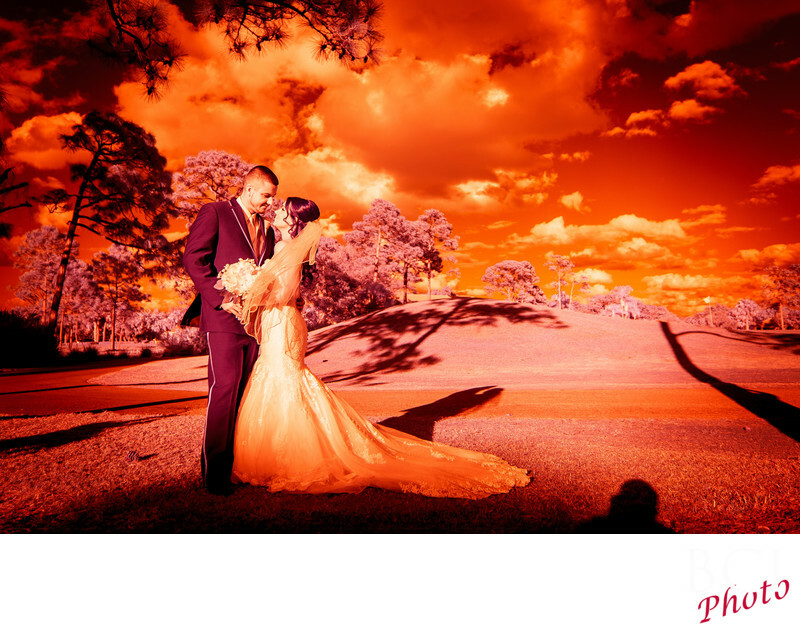 This is a super example of our strawberry fields custom toned infrared images. First off it starts with the capture being done with our custom modified camera that only "sees" the infrared portion of the light spectrum. Then we add our strawberry treatment for a totally unique and romantic image that no other company in florida can reproduce. Traditional infrared captures are displayed in monochrome black and white. We do many of ours that way as well. However we have added several new flavors to our infrared repertoire. Strawberry (pictured), chocolate and blue jean flavors all render the images in an amazing way. Each unique in its own right. Many of our couples select their album covers, thank you card images and Wall art images from the totally unique and powerful infrared set of images from their wedding day. These have enormous wow factor and really can set your wedding collection apart from the mundane. If you want something thats totally unique, you have to check out our infrared images.